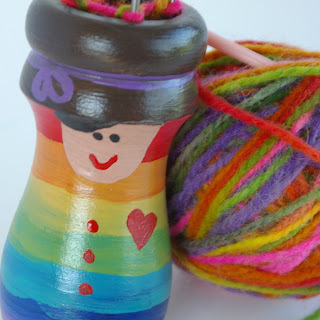 While looking for resources to teach my daughter to finger knit (there is a great video here) I stumbled across a reference to a knitting nancy. You remember! The spool or corking set you had as a child for making those long tails of knitted yarn from the scrap bag! Looking a little further I couldn't find much available for a child to use today for practicing handiwork. So a little tinkering and a few trials and errors and I came up with a design I am happy with and I am offering a couple for sale in our shop anniversary this Tuesday/ Wednesday. Suitable for kids age 4+. gorgeous! you can get plenty where i live, but of course, all flimsy plastic..
My daughter's was called a knitting mushroom. She just loved it! Yours are just lovely! Good luck!